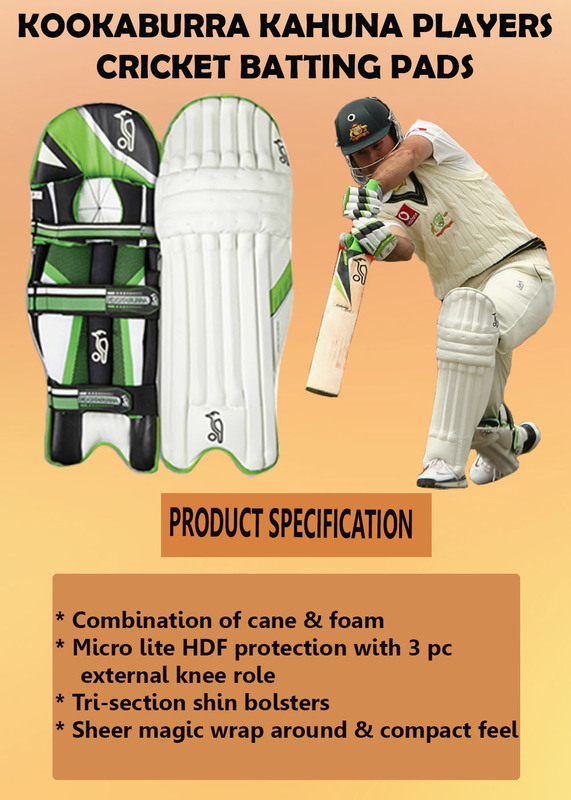 BEST 5 KOOKABURRA CRICKET BATTING PADS | Khelmart.org | It's all about Sports. 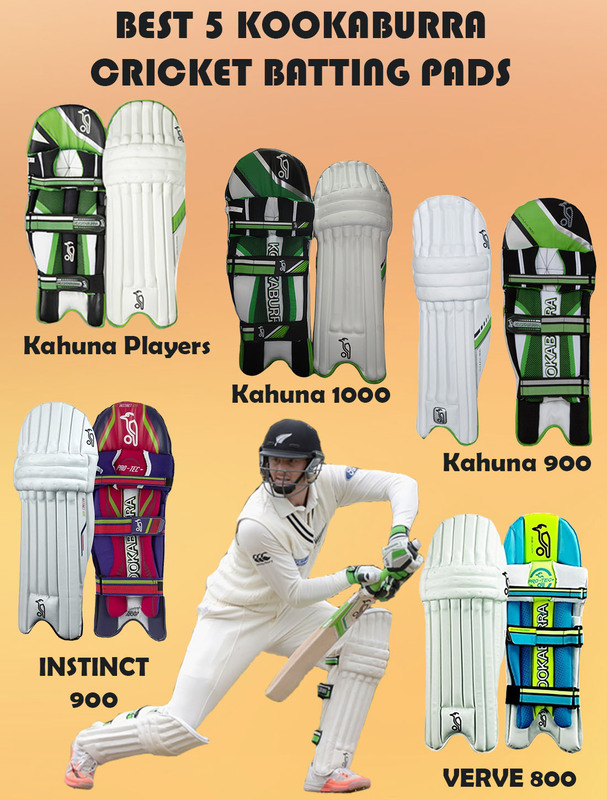 Kahuna Players Cricket Batting pad is top line batting pad from Kookaburra. This batting pad is equipped with best quality protection which is suitable for all round type of play.This Pro level batting pad is suitable for professional to entry to pro players . This batting pad is made from top quality Micro Weight Rounded HDF ,Cane Rods inserts. 9 Cane Width for lead leg.HDF Side Wings. 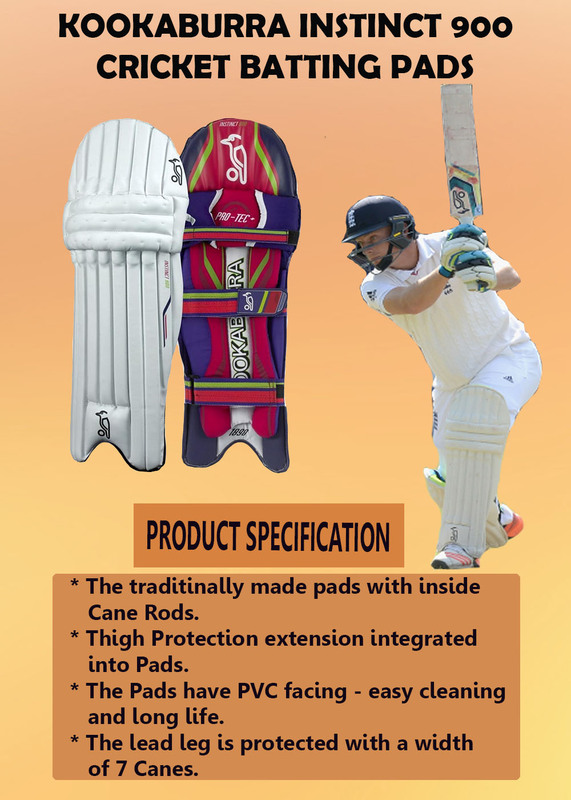 Kookaburra used new level of protection for the Thigh integrated which offers a unique combination of pads. This Pad is equipped with .Ergonomic Calf Strap for easy fastening.Leather and Piping for durable in-step.Brushed Cotton Fabric for comfort. 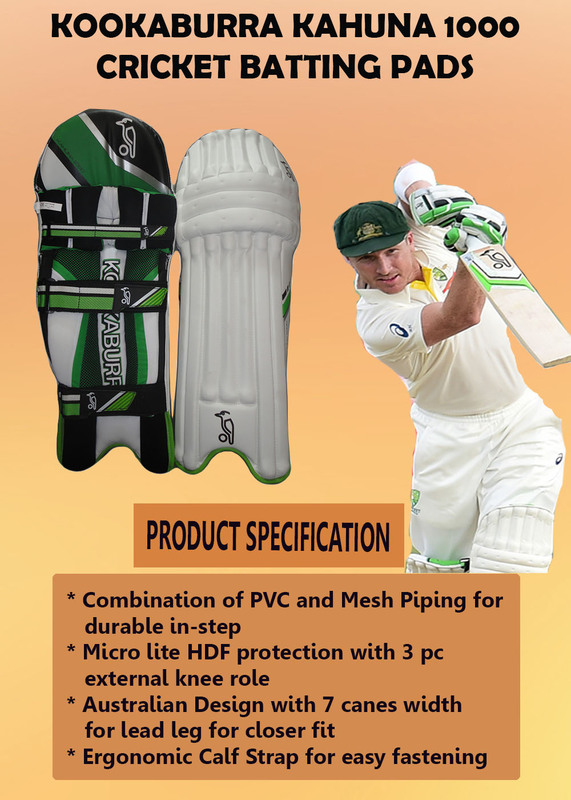 These batting pads are level 4 cricket players pads developed for advance cricket players. Made from lightweight cane rods and High density foam. 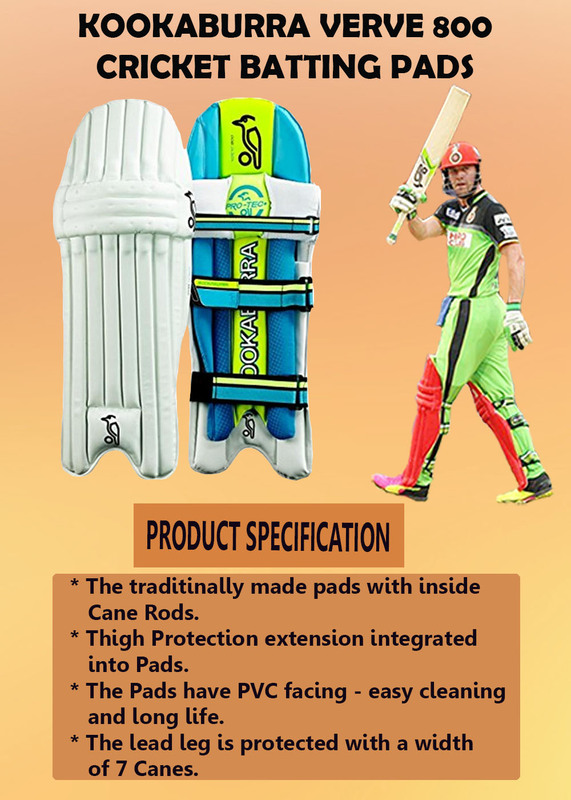 This batting pad is equipped with Ext Knee which offers best in class Knee support.kookaburra used External Knee Roll with Vertical booster which gives better protection and perfect pad shape. Proteck Plus: This technologies enables high density foam at Knee roll wraps which works as shock absorbing device to absorb the unwanted impacts. 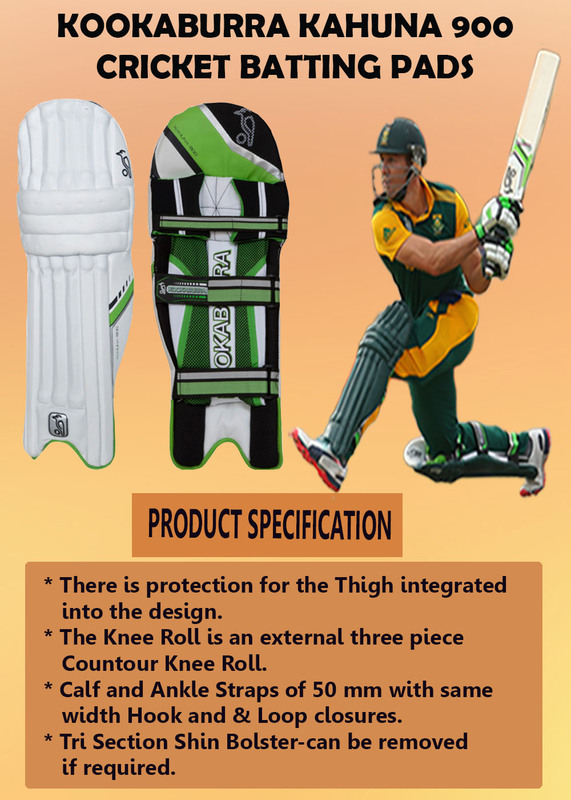 Kookaburra used triple section shin bolster to protect the shin area of cricket players.This type of construction helps in better and durable protection. Kookaburra Verve 800 batting pads gives combination of traditional and modern materials that creates the ideal mix of playability and leg guard protection.It is developed with Level 4 quality cricket pads featuring Light Weight Square HDF rods, Integral HDF Thigh Protection PVC Faced, Three Piece external Knee Roll with Vertical Bolsters provides enhanced shape retention and 7 Cane Width with Unique 2 Piece Side Wing providing enhanced flexibility & comfort. Instinct 900.Kookaburra Instinct batting pads are professional players quality (Level 4) cricket pads with lightweight square HDF rods, integral HDF thigh protection and Contour.Kookaburra’s industry acclaimed high density foam and cane construction offers the ultimate protection from injury, instantly dissipating impacts.Kookaburra Instinct batting pads offer a combination of traditional and modern materials that creates the ideal mix of playability and protection. This entry was posted in Cricket and tagged BEST 5 KOOKABURRA CRICKET BATTING PADS, IMAGES OF BEST 5 KOOKABURRA CRICKET BATTING PADS, SPECIFICATION OF BEST 5 KOOKABURRA CRICKET BATTING PADS. Bookmark the permalink.